A recent visit (my first) to First Agro Farms at Talakkad near Mysore, was a day well spent walking through fields of greens and vegetables all grown without the use of pesticides. It was an enriching experience – but more about that, coming up, in My Diary. 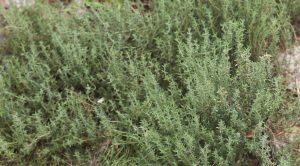 This post is about the fresh thyme we saw at the farm and the recipe for Lemon Thyme Rasam that I promised to post, for Priya, who was one of the other visitors that day. 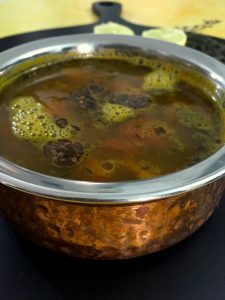 Rasam is a regular part of the meal at any South Indian household, served with rice and usually a dry curry and appalams. It is gaining popularity in other parts of India as a form of Soup, rather than with rice and curry. There are many versions/ varieties of Rasam, all of them tasty. The addition of fresh herbs such as coriander and curry leaves to this Lemon Thyme Rasam enhances the taste and adds to the health quotient. 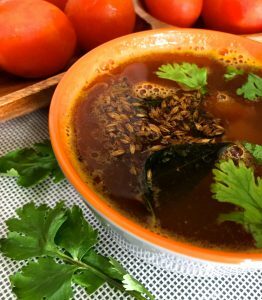 Here is the link on this blog for my recipe for a traditional homemade rasam powder from a Tamil brahmin kitchen, and a recipe for tomato rasam using the rasam powder of the earlier recipe. This one though, is a twist on the regular rasam – a LemonThyme Rasam. Purists may find the idea unappealing, so I will just say, don’t knock it till you have tried it! Apart from the flavour added by the thyme, the added nutrients and disease fighting properties are worth looking into. Thyme has many uses in medicine, eg as a diuretic, a stimulant for the appetite, to bring down stress, as a germ killer in mouthwashes, etc. You may want to reduce the quantity of thyme added to the Lemon Thyme rasam – I have suggested 1 tablespoon for 3 cups of water, however you could first try with half a tablespoon and then add more depending on how strong you want the thyme flavours to be. Thyme is a herb with several properties which aid in good health. Thyme contains flavonoid phenolic antioxidants like zea-xanthin, lutein, pigenin, naringenin, luteolin, and thymonin and the fresh leaves have high antioxidant levels. Packed with minerals and vitamins thyme leaves are one of the richest sources of potassium, iron, calcium, manganese, magnesium, and selenium, as well as a rich source of vitamins such as B-complex, beta carotene, vitamin-A, vitamin-K, vitamin-E, vitamin-C, and folic acid. Thyme also has vitamin B-6 or pyridoxine; pyridoxine keeps up GABA (beneficial neurotransmitter in the brain) levels in the brain which has a role as stress buster. Thyme, like most herbs, has been in use since ancient times. The Romans treated melancholy with thyme, while it was popular with the Greeks in incense as well as being a symbol of elegance and courage. With origins in the Mediterranean area, the cultivation of thyme has spread across the world and was brought to North America by the first colonists and used both as a food preservative and as a medicinal herb. Thyme was also grown in European monasteries in the Middle Ages, for use in cough medicines and as a digestive aid. Though the herb is said to have no known side effects, like any other food, thyme should be consumed in moderation, specially during pregnancy. Which means, during pregnancy it is better to use it as as seasoning, sprinkle it in soups and stews and on meat, but not steeped in teas etc. 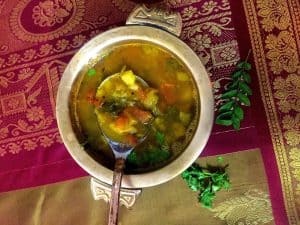 The Lemon Thyme Rasam from this recipe uses fresh thyme (zero pesticide of course, you all know that I am lucky enough to buy all my fresh produce from First Agro Farms). The thyme leaves should be stripped from the tough stems. They tend to scatter, so I always keep a clean large bowl to catch the leaves as I remove them from the stems. However dry thyme can be substituted if fresh is not available, though the quantity should be reduced to 1/2 a tablespoon instead of 1 tablespoon of fresh leaves. Thyme has a strong, pleasant aroma. Just making the Lemon Thyme rasam gives me a feeling of euphoria and well being. 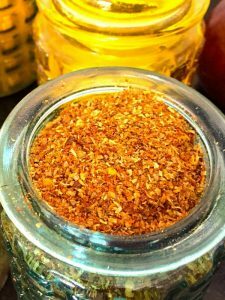 An unusual ingredient to add in a traditional item such as rasam, but the thyme does take it to another level. Being good for alleviating coughs and sore throats, it may be added to the pepper (millagu) rasam which a favourite when one is feeling under the weather. A dash of lemon juice at the end, and this quick and easy dish is ready!